Want your little one to participate in a little money making scheme the legal way this summer? Why not teach the young ‘un on how to go about making a mean cup of lemonade? That’s what the FreshForce Citrus Juicer is all about, as it will make squeezing the juice out of your citrus fruits a snap. 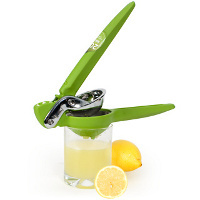 Perfect for lemons, limes and small oranges, the FreshForce utilises a patented inverted stainless steel mechanism to dramatically increase its juicing power, squeezing up to 20% more juice from citrus fruit and reducing unwanted pulp. It’s every cocktail lover’s dream. Ooh, freshly squeezed lime juice! Built to last with chromed, die-cast zinc metal parts and durable nylon handles, the dishwasher safe FreshForce is an ideal gift for anyone who finds squishing citrus fruit a chore. At £19.99 a pop, it shouldn’t take too long before you make back your money for this, and it sure as heck saves you a whole lot of time and trouble from getting every drop of vitamin C goodness out of all those lemons! You know what they say, when life throws you a lemon, make lemonade out of it!